Posted on December 6, 2017 March 19, 2018 . 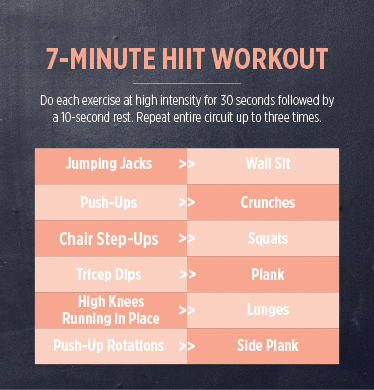 High-intensity interval training (HIIT) is a great workout for people with little time to spare. It can be done just about anywhere and very little equipment is needed. With a HIIT workout, you get and keep your heart rate up throughout your workout, which will increase your metabolism, burn more fat, build more lean muscle, increase strength, and improve cardiovascular and muscular endurance. HIIT workouts also stimulate the production of your human growth hormone (HGH) by up to 450 percent during the 24 hours AFTER you finish your workout. HGH doesn’t just burn calories—it also slows down the aging process, helping you look and feel younger! Intensity and recovery time are the keys to the HIIT workout health benefits. You need to give it your maximum effort, but only for the set time for each exercise. You need to rest between each exercise—and also between workout sessions. Doing HIIT more than three times per week can be counterproductive, so try these workouts every other day for your best results! Your total workout can be done in 30 minutes or less! Keeping proper form, perform as many reps of each exercise as possible in a 30-second interval, then rest for 10 seconds between each exercise. Perform up to three sets of each exercise if you want to work out longer. 1 Jumping Jacks: Start by standing tall, feet hip-width apart and your arms at your sides. Jump your feet out while raising your arms. If a regular jumping jack is too difficult, step side to side while raising your arms instead. Perform as many reps as possible in 30 seconds. 2 Wall Sit: Stand with your back against a wall, arms at your sides or across your chest. Walk your feet out one to two feet in front of you, feet about hip-width apart. Slide your back down the wall until your knees are at a 90-degree angle above your ankles and thighs parallel to the floor. Push into your heels and hold this position for 30 seconds, then straighten your legs and come back to a standing position. 3 Push-ups: Start in the plank position but place hands slightly wider than shoulders. Bend elbows, keeping them close to your body, and lower your body to the floor, as far as you can go, and then push back up. Beginners can do the push-up on their knees, keeping the body in a straight line from head to knees. Perform as many reps as possible in 30 seconds. 4 Crunches: Lie on your back, bend knees with feet about hip-distance apart, or you can keep them suspended in the air during for a little extra crunch. Place your fingertips near your ears on the back of your head or cross arms over your chest. Exhale and pull your belly button in toward your spine, contracting your abs, and lift your shoulders towards the ceiling. If you have your hands behind your ears, don’t let your elbows come together, keep them level with your ears. It’s very important not to lift your entire back off the floor because this can cause back strain. A good way to prevent this is to always try to keep looking up at the ceiling. Inhale as you return to your starting position. Perform as many reps as possible in 30 seconds. 5 Step-Ups: You will need a platform, step, or chair that will allow your knee to bend to a 90-degree angle or more. Begin by standing tall, facing the platform, step, or chair. Arms at your sides, tighten your abdominals and step up and place your entire right foot on the platform. Exhale and press through your right heel as you step up onto the platform, bringing your left foot up to meet your right foot so you are standing on the platform. Step down with the right foot, then the left foot so both feet are on the ground. Alternate the lead foot with each step up. 6 Squats: Stand with your feet shoulder-width or more apart, arms at your sides. Keeping your body weight on your heels, keep your back straight from your head to your tailbone, bend your knees and lower your body as low as you can go. Also, as you lower, bring your arms out in front of you. At the bottom of your movement, slowly press through your heels and contract your glutes as you raise your body back to the starting position. Repeat as many as you can in 30 seconds. 7 Tricep Dips: Sit on the edge of a sturdy chair, table, or on the floor, hands at your sides. Feet flat on the floor, about hip-width apart, in front of you, so that when your body moves forward your knees are above your ankles. Hold your abdominal muscles in, slowly bend your elbows and lower your upper body down toward the floor until your arms are at about a 90-degree angle, then push yourself back up. If you’re a beginner, place your feet closer to the chair, just bend your elbows slightly and hold your body up and away from the chair. For more of a challenge, place your feet further away from the chair and deepen your dip. Repeat as many as you can in 30 seconds. 8 Plank: Start in a push-up position, arms straight, shoulders directly above your elbows and wrists, keep your body weight on your hands and the balls of your feet, contract your abs, and keep your body in a straight line from your head to your feet. If you’re a beginner, instead of being on your hands, rest on your forearms, keeping your shoulders directly above your elbows. Hold this position for 30 seconds. 9 High-Knees/Running in Place: Stand tall and march, lifting your knees, one at a time, as high as you can, or just run in place. Try to lift your knees up to hip level but keep the core tight to support your back. For a more advanced move, hold your hands out in front of you, at hip level or higher, and try to touch your knees to your hands. Lift your knees towards your hands instead of reaching your hands to your knees. Continue this move for 30 seconds. 10 Lunges: Stand tall, looking forward with your feet shoulder-width apart and shoulders back. Contract your abdominal muscles to keep your spine straight and stable. Step forward with one leg, keeping your back straight and tall. Lower your hips until your front knee is bent at approximately a 90-degree angle. Your front knee should not extend over your ankle, and your back knee should be just above the ground. Keep your weight on your front heel as you push back up to starting position. Repeat, alternating sides, as many as you can in 30 seconds.